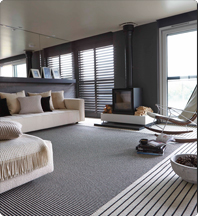 At Carpetright we are very proud that we can offer you the best service concerning your floor! And the opportunity to have your floor fitted by one of the FITA certified fitters. It takes a true craftman to fit the perfect floor, it demands experience and skills. It goes without saying that all our fitters are accredited, not only by us, but by the independent advisory body FITA. We feel that, when you’ve chosen a perfect floor, it should be fitted perfectly into your home! Please, let the fitters recommended to you by us do all the work while you relax!